Loved and admired by audiences and dancers alike, Queensland Ballet Principal Dancer Rachael Walsh announced her retirement in July. 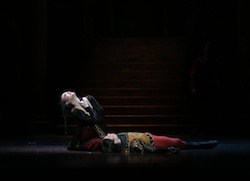 A graduate of The Australian Ballet School, Walsh commenced her career with Queensland Ballet more than 16 years ago and finished on a high, performing the role of Lady Capulet in Sir Kenneth MacMillan’s production of Romeo and Juliet in front of a full house at the culmination of a record-breaking season of the production. She joined Queensland Ballet in 1998 and was promoted to Principal Dancer in 2002. Rachael has performed both classical and contemporary works during her luminous career, as well as had original works created for her. Rachael Walsh in Francois Klaus’s ‘Fonteyn Remembered’ in 2010. Photo by Ken Sparrow. 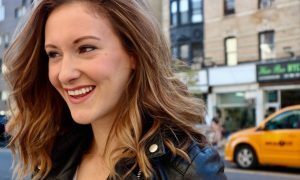 Dance Informa recently spoke to Walsh as she was settling into life post-dance. Congratulations on a wonderful career as a dancer! Was it hard making the decision to hang up your dance shoes? “Thank you, the profession has been truly generous to me, returning all the love and more that I have devoted to it. In my heart, I will always be an artist, and finally hanging up my pointe shoes after a long career in classical ballet is a choice to keep moving forward into new experiences and knowledge. A part of me would keep dancing forever if given the physical powers to do so, but I now need to acknowledge the part of me that wants to learn new things and challenge myself in other arenas. I want to keep allowing my world to grow bigger, whilst caring for my body which I have punished physically 50 weeks a year for the past 19 years. Your last performance with Queensland Ballet was in Romeo and Juliet. Tell us a bit about that night. “It was an incredible evening… the final performance of Sir Kenneth MacMillan’s Romeo and Juliet in the Lyric Theatre. Romeo and Juliet has always been my favourite story to tell as a dancer and during my career I have enjoyed Juliet many times, having had the role created on me by Francois Klaus in his production. The young lover’s story and Prokofiev’s haunting score never grow old for me. It is so special to be wrapped around that music. Rachael Walsh as Juliet with Christian Tatchev as Romeo in Francois Klaus’s ‘Romeo & Juliet’ in 2010. Photo courtesy of Queensland Ballet. MacMillan’s production, one of the world’s greatest, was monumental for Queensland Ballet. It was a stunning success for the company and breathtaking to be involved in. The whole week in the theatre was super charged with excitement, especially as joining Queensland Ballet across the performances were international guest artists Tamara Rojo, Carlos Acosta, Steven McRae, Steven Heathcote and Daniel Gaudiello. On this evening, I was Lady Capulet, a role I cherish and absolutely loved performing alongside one of my personal heroes, Steven Heathcote as Lord Capulet. Carlos Acosta was Romeo that evening and it was announced it would be his last performance as Romeo. I was very calm and I just wanted to live in each moment of the evening, soaking in and absorbing all the emotion of the ballet, the theatre and the dancers. I was onstage with many dear friends and in the audience were many ex-dancers, family and friends. Rachael Walsh and Christian Tatchev in ‘Romeo & Juliet’ in 2010. Photo courtesy of Queensland Ballet. What will you miss most about dancing? What will you miss least about dancing? What are you looking forward to doing that you couldn’t do while you were a dancer? What has it been like seeing the Queensland Ballet transform in the last few years under the guidance of Li Cunxin? 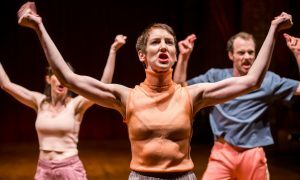 “After many years under the direction of much loved choreographic directors Francois Klaus and Harold Collins, Queensland Ballet is now running very differently artistically under Li’s direction. Rachael Walsh as Lady Capulet in Sir Kenneth MacMillan’s ‘Romeo & Juliet.’ Photo courtesy of Queensland Ballet. 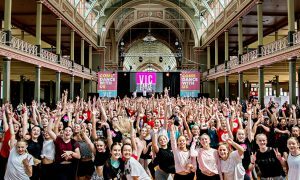 Li’s bold vision to build the company’s presence in the community and to bring the world to Brisbane with international repertoire and guest artists has brought to Queensland Ballet a new energy, confidence and an excitement that has certainly engaged the dancers as well as the public. For more information on Queensland Ballet visit www.queenslandballet.com.au. Photo (top): Rachael Walsh and Zac Chant in Francois Klaus’s Cloudland in 2005. Photo by Ken Sparrow.